Most B2B marketers have looked at, tested and maybe even fully invested in predictive analytics. Few, however, have got the overall formula right. A predictive solution is only as good as the people, process and data used to implement it. If you want to get value for money, your predictive analytics strategy needs to be closely integrated with your outbound telemarketing efforts. Talk to predictive analytics providers like 6Sense, Mintigo or Lattice Engine and these are the kind of claims you will hear. They are beguiling, but they only represent half the story. And this is less about the vendors’ hyperbole than our own desire to believe in demand generation silver bullets. What is often lacking is a business plan focused on how to measure success. Instead, the investment is centered on the hope that predictive tools, once plugged into the data, will magically transform marketing’s ability to find leads that are ripe for sales conversion. The real story is slightly more nuanced than this, and there are 5 key points to consider if you want to turn marketing hyperbole into real world success. Descriptive Analytics: according to Dr. Wu, “the purpose of descriptive analytics is to summarize what happened”. It is sales data, social “likes”, email clicks, online form data, purchase history. It is stored on CRM systems, MAP tools, data warehouses, data lakes, and is supplemented by the ‘firmographic’ data that we have traditionally used to home in on our target audiences. Descriptive analytics summarizes raw data into digestible chunks that help the business understand what is happening, often summarized in the form of segmentation studies or funnel reports – which are in effect consolidations of descriptive analysis. Predictive Analytics: this takes the descriptive outputs and attempts to ‘predict’ what is likely to happen next, for example, creating a model to identify which leads generated and nurtured in the last 6 months are most likely to convert based on the data available (descriptive analytics). The model digests that data and applies algorithms and statistical calculations to suggest what is most likely to happen next. This enables us to focus our efforts on likely future outcomes. But you need to validate the model to know if it is right. As Dr. Wu clarifies: “Anyone can build a model: proper validation is the only way we know, with certainty, if it actually works”. Once the model has been validated you can start to move to a more actionable layer of analytics – prescriptive. Prescriptive Analytics: this combines validated predictive models with actionable, ongoing test and learn feedback loops, enabling marketers to continuously evolve the model based on changing buyer behaviour. This might enable marketing to prescribe rules to the data to identify likely prospects earlier and earlier in the buying process. But this can only happen if B2B marketers have resources that can scale a “test and learn” method to action predictive models and validate them. Predictive analytics is not the answer in itself. It is a tool that enables you to direct your efforts more fruitfully. And this is where you have to think about the systems, data, processes and people skills needed to leverage that predictive investment and turn it into the desired outcome. While predictive analytics may steal the limelight, its success hinges on the integrity and availability of solid descriptive data. 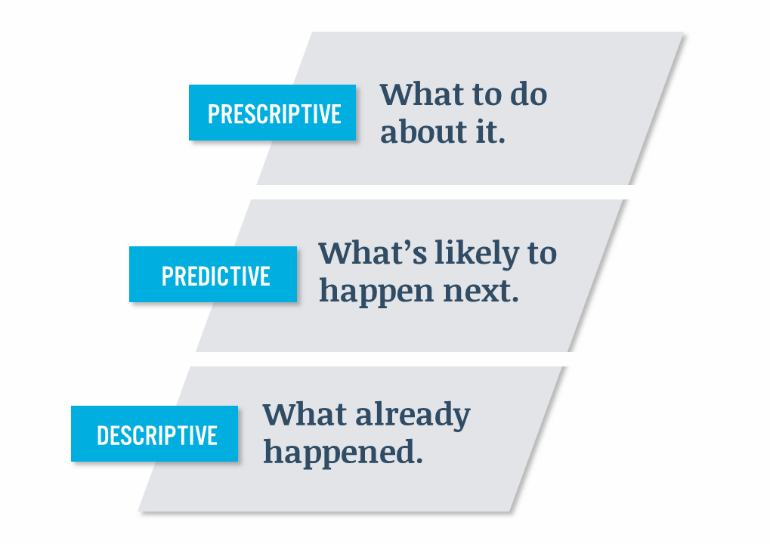 Descriptive analytics is what adds context and meaning to the outputs from a predictive model. Establishing this context involves, for example, a sensible system for tagging content and campaigns, so you can understand the levers and drivers that the predictive model is using to show propensity. Essentially, before building a predictive model you need to get all your pieces and parts in one place and make sure you have context around what each piece of data actually means. Only then is the predictive analytics engine able to do its work. The beauty of predictive analytics is that it can be applied outside your own carefully orchestrated communications channels. Predictive data models can use data from third parties to spot the behaviour typical of someone about to make a decision on a product. Just because a prospect has not clicked on your emails in the last six months, it does not mean he or she is not likely to buy. Without predictive analytics it would have been easy to assume these accounts were not interested and you could have ignored them. So you have the insight. You’ve found your targets. The biggest mistake now is to assume you can succeed by just handing the list of accounts and contacts directly to sales or inside sales. They typically do not have the capacity to make the required volume of calls per day, with the average rep focusing on managing 300-400 accounts. Rigorous, specialist ‘hunting’ skills are required – trained telemarketing specialists who will find the real decisions makers and key influencers that need to be engaged. MarketOne has used predictive models to trigger both digital and tele outreach, and we can confidently say that companies that invest in tele-prospecting as the primary means to test “predictive analytics” achieve the best results. This is not to say that the use of predictive tools cannot increase digital engagement rates – they do. But to find the deals ready to convert, you have to pick up the phone. In analytics circles this is what is required to validate the models, which then can prepare you for the next phase of analysts – prescriptive. Predictive analytics does not remove the need to build out a comprehensive nurture framework. Even in a successful pilot, 65-70% of the accounts targeted will not convert right away, especially if the model used ‘missed the mark’. It would be short-sighted to waste the effort spent communicating to buyers. While you may need to shift gears and try a different model that finds those who are ready to buy immediately, it’s well worth continuing early-stage conversations with even those prospects you may have “missed the mark” on. This is where remarketing campaigns and email nurture programs delivering content appropriate to the buying stage really come into their own. As we have established (and as you really knew, deep down), predictive analytics is not a silver bullet. But leveraging predictive data will give you a significant edge. Do it the right way and you will focus your resources on those with the greatest likelihood of buying, which will give you not only better numbers in the long run, but also a confidence that you are aiming in the right direction. Only when your data strategy is fully aligned with your sales and business strategy will you get the best return on your investment. Looking for somebody to help with predictive analytics? Why not chat with us?